Badwater Pro, Other Shape Guitar from Axl Guitars. The AXL Badwater Pro is the company's response to requests for a Badwater guitar with upgraded professional components and hardware, AXL says. Built with a resonant ash body, then hand-distressed like all Badwater models, it features a Trem-King bridge that allows string bending both up and down so players have "expressive control over their playing." The satin finished maple neck makes this guitar feel already worn in, and the 3 single-coil EMG-designed Alnico pickups give guitarists the chance to dial in a variety of tones, the company says. "Grover tuners are designed to help keep the Badwater Pro perfectly in tune after tremolo dive-bombs," AXL says. Available March 2010. No pricing info yet. 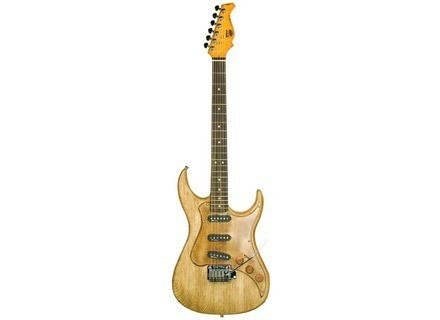 For more information, check out www.axlguitars.com. B.C. Rich Zoltan Bathory Signature Model B.C. Rich introduced three Zoltan Bathory Signature ASM model guitars.